Here is the link to our group project, check it out! If a project includes all of these aspects, such as the Charles Booth Archive or the Rosetti Archive, then we can learn from them in hopes of creating our own. 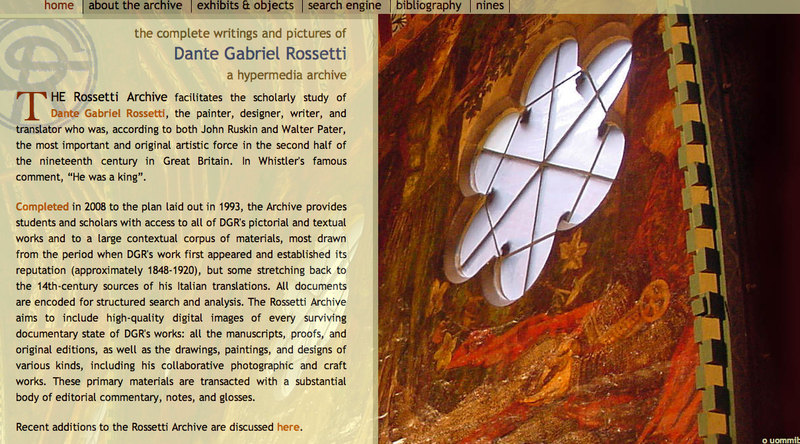 The scholarly nature of both archives adds to their legitimacy; in fact, thanks to each sites’ design, the presentation of information is transparent, and bibliographic notes are included. Digital Humanities allows scholars to ask new questions that would have been almost impossible prior to the proliferation of the internet. Collaboration throughout the world is much easier now, which increases the variety of viewpoints for a particular subject. Another advancement that promotes new questions is the use of interactive maps which can be toggled on or off. This gives scholars a tool to investigate that would be either too difficult or too time consuming to recreate prior to digitalization. These are just two of many innovations in thinking digital humanities has hoisted upon the world; it will be interesting to see how the discipline grows and changes with time. Current Google Map of Regent Street leading into Piccadilly Circus. Note several upscale shops on Regent in this area today. 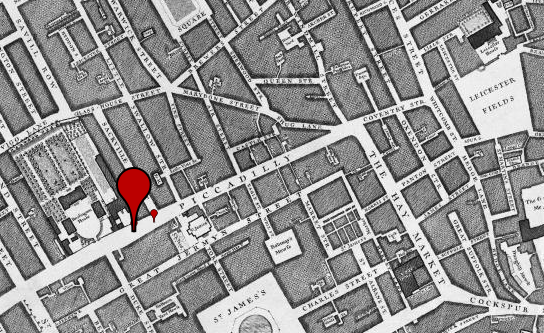 Using http://www.locatinglondon.org, a 1746 map shows Piccadilly, but Regent Street doesn’t exist yet. “The Hay Market” on the right corresponds to the lower part of the future Regent Street. Although the jewelry shop was fictional, Booths’ map shows red and yellow which indicate the upper end of income. 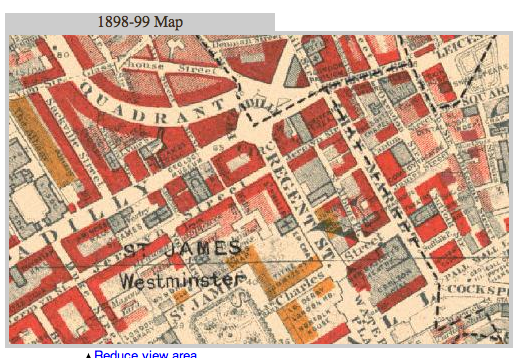 It can be established that the Regent Street/Piccadilly Circus area has been wealthy for over a century, at least. Finally, British History Online provides an even deeper glimpse into the history of Regent Street. This website reinforced the facts that I already knew; the commercial aspects and the wealth of the area were well established. However, I also discovered when Regent Street was designed and built (1813), why it was named as it was, and the architect behind the buildings (John Nash). The long vista of Regent Street, as seen from the Quadrant, is very fine, exhibiting, as it does, a remarkable variety of architectural features. It was erected principally from the designs of Mr. John Nash, who deserves to be remembered as the author of this great metropolitan improvement; and it was named from the architect’s patron, the PrinceRegent. The expenditure of the Office of Woods and Forests in its construction was a little in excess of a million and a half. Of course, being a thoroughfare of so recent a date, having been commenced in 1813, Regent Street has scarcely a back history for us to record here, like Pall Mall and St. James’s Street. It belongs to “new,” and not to “old” London. In his design for Regent Street, Nash adopted the idea of uniting several dwellings into a façade, so as to preserve a degree of continuity essential to architectural importance; and it cannot be denied that he has produced a varied succession of architectural scenery, the effect of which is picturesque and imposing, superior to that of any other portion of the then existing metropolis, and far preferable to the naked brick walls at that time universally forming the sides of our streets. Sir Arthur Conan Doyle penned all the Sherlock Holmes stories between 1891 and 1927, creating a literary legend that would not soon be forgotten. By using topic modeling techniques and some fancy algorithms, we can investigate the potential relevance of word usage in his stories. The Great War was a momentous event that almost exactly bisected Doyles’ creations, so I will view my ten topics through this lens. 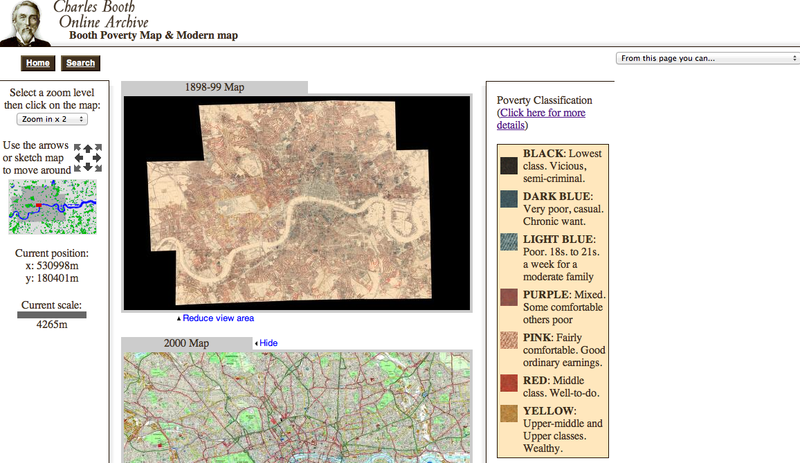 I found an interesting website for historical background on London during this time period, which helped me to identify significant events. In contrasting estate and business, I noticed a spike in the former before 1905 and again before 1910. This could have been because British colonies had large tea estates in India. However, estate crashed back down after 1910 and business led throughout the rest of the time period. It is possible that the industrial growth of London led to this change, and both words are lower during the war and flu pandemic of 1918. Regarding search and case, there is a slight rise in each during the war years. Once again, the flu of 1918 and the peak of both words during the 1910-1920 decade may involve correlation rather than causation. The term search may also have increased during the war because soldiers could be missing in action. The suffragettes, the Irish ‘Home Rule’ movement and trade unions all agitated for change, sometimes with violence. In 1918 some political demands were met through the Representation of the People Act, which gave the vote to working men and women over 30. Appearance quite possibly became less important than expression after the war, due to the realities it forced upon the people of London. This trend continued through the 20’s, as the growth of jazz may have led to expression becoming more common. Silent reflection had an interesting spike in 1908, and it dropped precipitously, becoming equal to public by 1914. It is possible that the Alien Act impacted this word usage, as many immigrants tried to come to London during this period. Perhaps many Londoners had thoughts about the impact on their society, but the war decreased their time for such thoughts. While I am not certain about these linguistic developments, I feel topic modeling could be an important tool to help scholars revisit the past, specifically helpful in distinguishing how history affects word usage. 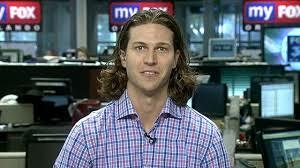 Pictures and facts for all ten New York starting pitchers. This heat map accentuates New England and the Dominican Republic; both areas are home to two NY pitchers. Masahiro Tanaka, a recent signee from Japan, is the only pitcher not from the Western Hemisphere. Although CC Sabathia stands alone with 14 years, the network of Harvey, Wheeler and Pineda can be seen together, each having 2 years pitched. Bartolo Colon and CC Sabathia represent more than half of the collective professional experience of the pitchers. Note the overall slope, as velocity decreases with age. The majority of the NY pitchers are under 30, and Bartolo Colon is timeless. I don’t tell many people this, so consider yourselves lucky. I have my super-secret time machine whirring to life in the garage, so why don’t you join me on a trip? We can travel back into the 19th century to investigate three common words, how their usage began or changed during those hundred years, and potential reasons why this was the case. After we hide the Delorean, our work can begin. 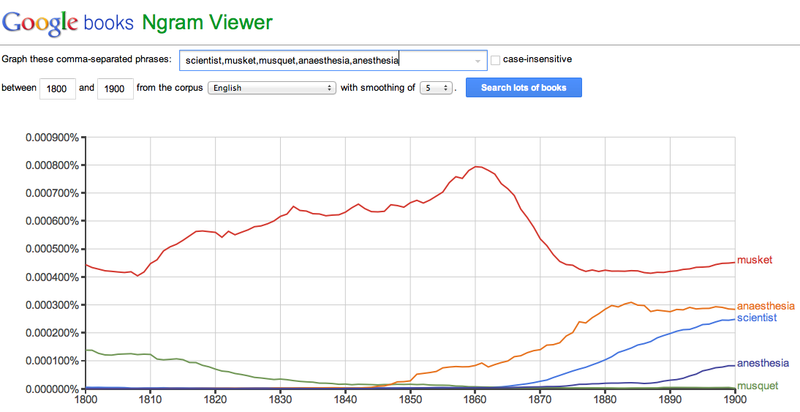 I chose musket (or musquet), anesthesia (or anaesthesia), and scientist, hoping that these three words would provide some interesting results from Google Ngrams. I set the years for 1800 to 1900, and settled on a smoothing of 5. The lower the smoothing number, the more jagged of a graph would be produced. Musket is a word that refers to a type of infantry gun, and it had French origins from the 16th century. There were many spellings throughout the centuries, which is why I included the most popular alternate spelling. From 1800 to around the start of the Civil War, its usage almost doubled. In this same period of time, musquet was about 1/4 as popular as musket by 1800, and it had basically stopped being used by 1860. This coincides with a sharp decline in musket after 1860 as well. According to Oed.com, musket was reserved for obsolete weapons, while the more common rifle was adopted for contemporary firearms. Next, I wanted to find a word whose usage began during the 19th century, and I settled upon anesthesia, which is generally spelled anaesthesia in Britain. 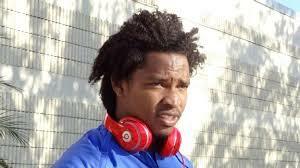 Both versions were included in the search, and it is derived from Latin. Prior to 1840, there is practically no use of anaesthesia, yet thanks to the Oxford English Dictionary, we can see the use increased greatly for the remainder of the 19th century, peaking in the 1880s. The American version, anesthesia, slowly grew in usage towards 1900, but was still well below the British spelling. Of course, this word coincided with better medical technology, especially during the Civil War in the United States. More succinctly, in 1834 a gentleman compared art and science, and if someone who practices art is an artist, then a practitioner of science should be a scientist. This is how scientist became a word, and Ngrams shows its usage grew by about 10 times from 1870 to 1900. 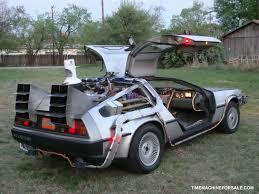 Ok, its time to go…you get to choose the time machine destination this time, though.